Collecting new leads through social media widens your reach significantly. However, you still need to interact with these potential customers and transfer the information somewhere you can track it. Zapier fills this gap. Every time your Facebook Lead Ads collects a new lead, all the information is passed straight to Teamgate, and the matching lead is automatically created in the Leads section for your sales processes to take over. 1. Setup Facebook Lead Ads form. 2. How to set up your Facebook Lead Ads? 3. How to configure Zap in Zapier? How does this Facebook Lead Ads - Teamgate integration work? Zapier automatically creates a lead on Teamgate. 1. What accounts do I need to have? Besides Teamgate account you will also need Facebook business and Zapier accounts. Facebook Lead Ads is a paid Zap. Find out about the pricing here. Zapier integration connects your Facebook Lead Ads with Teamgate and creates a new Lead. To start with, make sure that the fields you are going to add to your Lead Ads form match the fields in Teamgate Leads profiles. You can customize your Leads profile by following this instruction. Note: Carefully read Lead Ads policies and terms of service. 1. Navigate to Ads manager or Power editor. Click Create Ad on top right corner. Click Create Campaign on the top left corner. 2. Choose your marketing objective and click Lead generation. 3. Enter a campaign name and click Set Audience & Budget. 2. Set your Budget, Schedule, Audience, Placement, Optimization & Pricing and Delivery Type. Unlike other campaign types, you cannot target lead ads to people under the age of 18. 3. Click Choose Ad Creative. 1. Add text and pictures or video for your ad. 2. Add a Call To Action button, and choose a Conversion Tracking Pixel if you're using one. 3. Under What information do you want to collect from people? click Create New Form. 4. Create a title for your form and select the language. - Edit field IDs to change the column names for your data when you export your leads. This may be useful if your CRM requires specific column names to receive your leads. - Include organic leads when you download your leads. Choose this to include leads from people who see the ad either because they've been tagged in the comments or complete a form when viewing an ad preview in Ads Manager or Power Editor. 7. Add a context card. 8. Under What information would you like to ask for? you'll see the Full name and Email address are checked. You can also click More options if you want to ask for more info. 9. You can add maximum 3 questions when you are done click Next. 11. Enter the website URL you want people to go to after they complete your form and click Next. 13. The last step is to test in order to see how your Lead Ad appears on the desktop and mobile devices. For more information see: How do I create lead ads on Facebook? ; Lead Ads Testing Tool. Use this Zap "Add new leads from Facebook Lead Ads to Teamgate" or add Facebook Lead Ads from your Zapier account. 1. Click Create this Zap. 3. Select Facebook Lead Ads Account and click Save + Continue. 4. Select your Facebook page and Facebook Form > click Continue. Please note: the Facebook Form must be created in advance. 5. Test Facebook Lead Ads and click Continue. You may skip this step or Pull in samples if you want to test this step and click Continue. 6. Click Continue with Default Sample. 7. Select Teamgate account or Connect a New account and click Save+Continue. 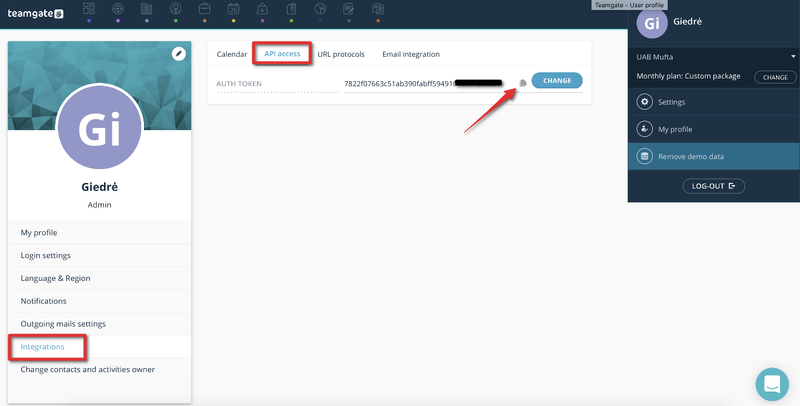 If you are connecting new account - copy the authorization token from your Teamgate account - navigate to My Profile > Integrations > API access > copy AUTH TOKEN. 8. Click Skip test or Send test to Teamgate.